What are the Skills Needed to Develop Android Apps? Your development skills as a web developer are much sought after in the Android development world. Especially the skills needed to develop android apps. Comparatively, good web design techniques are also in high demand in Android applications. Therefore learning Android apps skills will be a boon in the job market. This article points out the mobile application skills. That you will need to enhance the functioning of mobile devices. Java is the core language of Android development. Learning Java is one among the important skills needed to develop Android apps. You should have knowledge of basic syntax and programming structures. Moreover, you should know variables, lists, loops, control structures and object-oriented concepts like class vs. static methods and inheritance. Additionally, You should also be comfortable using documentation to learn how to use new parts of the Java SDK. You should be thoughtful about coding. Like, defining the types of data your applications plan to work with. And more carefully allocating scarce memory resources. XML was created to encode data for internet-based applications. It is a structured markup language somewhat similar to HTML. Learning XML is one among the skills needed to develop Android skills. Furthermore, you use XML to create intriguing layouts that form the basis of UI definition for all Android applications. You have to master the basics of XML which is needed to develop Android skills. 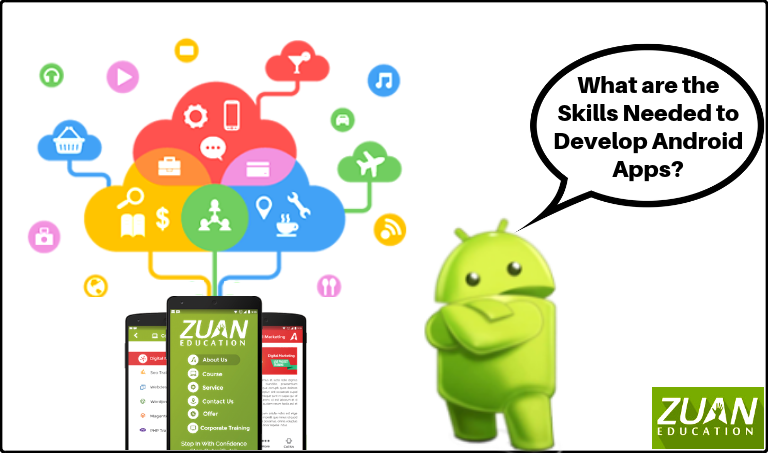 Knowledge of Android SDK is one among the prominent skills needed to develop Android apps. SDK stands for Software Development Kit. It is a set of pre-packaged code. Likewise, they are modules of Java code. It gives you access to device functions like the camera and accelerometer. Moreover, a key component of the Android SDK is a library called Gradle. For example, if you want to integrate Facebook with your app. You would then download a code library (or SDK) from Facebook. And then tell Gradle that you’re using it. So that when your application compiles, your code stays well organized. Correspondingly, as an Android developer, you will find out how various SDKs for Android can be pieced together to put together an application. The integrated development environment (IDE) of choice for application development is called Android Studio. This knowledge is needed to develop Android skills. Furthermore, Android Studio also features many of the capabilities developers expect of a full-featured IDE. It makes it absolutely seamless for android application development on any interface. Moreover, Android Studio is built on JetBrains’ IntelliJ IDEA software that is specially designed for Android development. You have to know the working of the android studio. Since it supports all programming languages of PyCharm i.e. Kotlin and Python as well as IntelliJ. As an Android developer, you will want to network with other devices. Many companies offer their own custom APIs. But you have to get comfortable with diverse APIs. This will help you to identify that no two APIs are similar. Therefore learning APIs is one among the important skills needed to develop Android apps. The syncing of data between local storage and remote database is important. To let users use the app when they’re offline. Another way to store data locally is through Android’s built-in support for using SQL to interact with an SQLite database. However, you choose to handle data in your application. Furthermore, you’ll need to explore and understand how databases work. Equally, also know the ways to query that data and use it in your app. This is one among the vital skills needed to develop Android apps. Google has released a set interface guidelines and standards called Material Design. Significantly, these standards include tips for how to layer various elements on the screen and use specific styles like drop shadows. You must have seen Material Design in the new Google Drive app or the new Inbox by Gmail application on mobile. Google recommends that you use these guidelines as a foundation for your own user interfaces. The documentation online provides a great foundational understanding of Material Design principles. Today many go to Google Play to download apps for various purposes. Therefore, these apps should meet the purpose of the users for optimal success. Moreover, skill sets in the app development vary according to changing needs and introduction of emerging technologies. You can also get Android training and the skills needed to develop Android apps before you venture into creating one. Specialized Android courses are offered in major cities in India.